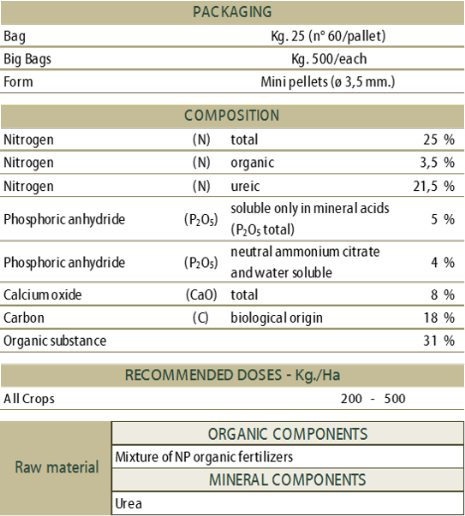 CONTAINS SELECTED TECTOSILICATES. SLOW RELEASE, IT DOESN’T CAUSE BURNS. UreaPro: it’s a revolutionary fertilizer which aims at the reduction in air and soil pollution, especially with a decrease in the quantity of Nitrogen (chemical and mineral) generally used. 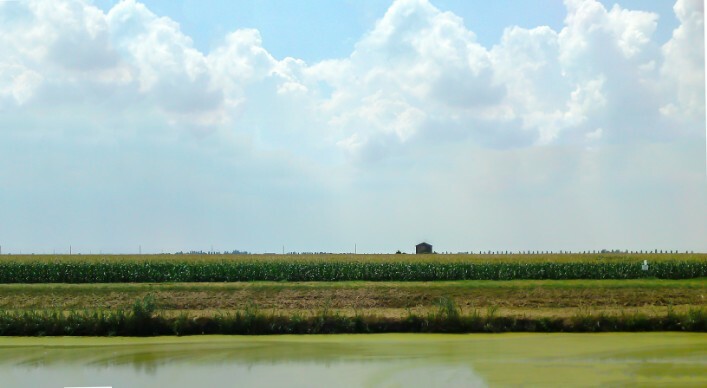 The recommended quantity for hectare widely falls under the parameters imposed by the Nitrates Directive and allows a better qualitative and quantitative crop production, affecting positively the economic return of the agricultural holding. UreaPro: it’s a mixture of urea and noble proteins (amino acids and peptides). The peculiar manufacturing techniques make the product uniform and integrated in the shape of tiny pellets, particularly hard, so that it can be distributed with seeders and/or tamping machines and will dissolve in the event of humidity. If the product is spread around the entire field with standard rotating manure spreader, even if it comes into contact with crops (young corn plants, etc) it doesn’t cause any damage or burns like traditional urea, both for its original composition partially different, and for the lower recommended volumes. Nitrogen, in ureic and organic solution, is linked to selected tectosilicates which allow a rise in the cation exchange, the proper retention of water and nutritional elements. It is available in short terms (ureic fraction) and in long terms (slow transfer of the organic component) based on the constant and continuous plants request. The product can absorb one and a half its own volume in water in order to make it available to the rooting structure of the plant, if needed, creating therefore a favourable environment which can eventually prevent water and/or nutritional stress. 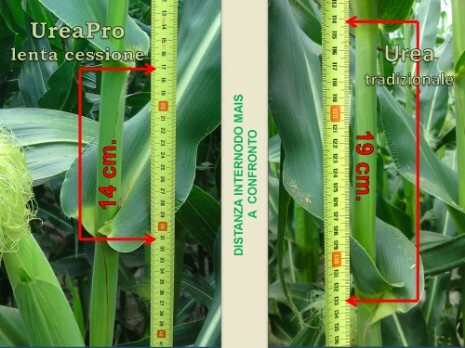 Compared to traditional urea, it’s more efficient and effective, hampering Nitrogen losses due to run-off and/or sublimation: we advise to use UreaPro at 70-80% of traditional, amount per hectare.